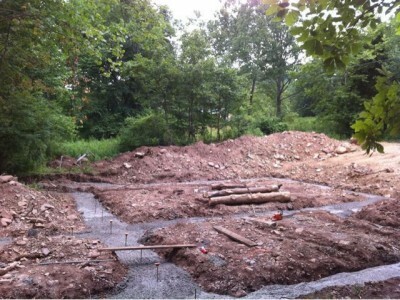 With the help of my dad, and friend Sam we poured our footers Tuesday. They required 34 yards of concrete. The engineer spec’d them 30″ wide, and 12″ thick. Also per spec, we poured 6 bag mix with 3 parallel pieces of #5 rebar tied with #4 crossbars every 2 feet.